It may be that for Mario Schönwälder concerts and collaborations are his primary contact with other human beings. Anyone who knows anything about Schönwälder knows that he is usually found with his nose buried in keyboard manuals, eyes analyzing synthesizer faceplates, fingers twiddling knobs, ears enclosed by headphones and his mind completely immersed in Spacemusic - nearly every waking moment. Thank goodness that he occasionally emerges from this complete absorption to perform live publicly and jam with fellow sequencer music aficionados. 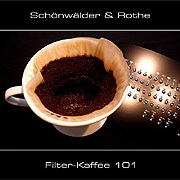 The album Filter-Kaffee 101 is the result of a number of these sessions. Long-time friend Frank Rothe joined Schönwälder for several creative encounters over several months, yielding eight electronic realizations in the classic vein of their Berlin-based predecessors. The mood of Filter-Kaffee 101 modulates easily from ethereal atmospherics to the many moving parts of an energized pulse. In one section disorienting sounds swirl amidst deep drones while several moments on rhythm and melody return in a charge of full-bodied leads and skipping tone patterns - echoing out in a precise machine-like whirl. Schönwälder + Rothe play sounds for the head, but their work comes straight from the heart. The genre of music they are exploring began back in the 1970s. Though its meaning has greatly changed over time, it still remains an engrossing refection - a universe unto itself. Spacemusic is liberating for musician and listener alike, with its truth always residing just beyond our grasp.